Kamigashi-hime, a magician heroine during the reign of the Emperor Keiko (A.D. 71-130), who while being attacked by brigands, transformed them into monstrous spiders and then destroyed them. 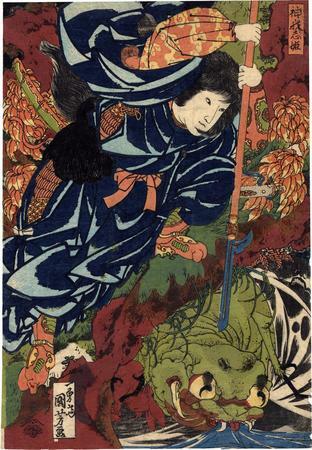 Basil Robinson wrote: "Kamigashi-hime thrusting her spear down on an earth-spider, which has emerged from its hole below her to drink from a stream." From the collection of B.W. Robinson. Use the zooming tool to enlarge this print so you can see the dead rabbit just to the left of the giant spider. There are a number of difference between this print and the one in the collection of the Museum of Fine Arts in Boston. (See the link above.) First off, they were published by two different houses. The one in Boston by Sanoya Kihei and this one by Tsutaya Kichizō. Both publisher seals were used over almost exactly the same time frame, i.e., the 1820s to the 1860s, but our guess is that the print in Boston is the earlier one. The second difference lies in the printing of both examples. Compare the area of the head of the giant spider in the Boston museum with the same area in the Lyon Collection sheet. The one in the Lyon Collection appears to have superfluous black ink marks on the tops of and above the creatures eyes.